Depressed Christmas is already over? Didn't get that Flight of the Conchords DVD like you asked for? Feel like your awful XMAS sweater deserves another night on the town? Too anxious to wait till the weekend to party? Bully plays Najstock TONIGHT. What is Najstock? Only the greatest post-XMAS party in history. 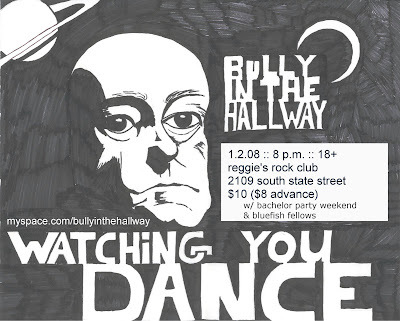 2. bully in the hallway's first show of 2008!